One of the major impediments in development of the production system of mahseer (Tor putitora) is an inadequate knowledge and dietary formulation of their feed. To fill such a gap of knowledge on nutrition, feed and feeding of mahseer we performed series of experiments with different life stages of golden mahseer. In our study with hatchlings and fry stage the most effective food was natural zooplankton. However, for the growth of growers effective diets were feed dominated with matter of animal rather than plant origin. Mahseer growth rate is slower than that of cultured carps, i.e. common carp (Cyprinus carpio), rohu (Labeo rohita) and mrigal (Cirrhinus mrigala). All studies were done in cages or tanks, but not in ponds as there was not enough of mahseer hatchlings, fry and growers. Since mahseer hatchlings and fry also showed increased growth with natural planktonic food, it can be suggested that mahseer larval and fry growth rate could be similar to that of cultured carps. Adult mahseer grew well with feed containing a high percentage of animal and low percentage of plant components. This might be due to their preference for animal food. Gut content analysis of mahseer ranging from 250 to 3 000 g confirmed their preference for food of animal origin. However, the fish can be sustained by offering both types of food. Understanding feed, feeding and nutrition of fish species suitable for fishery and aquaculture development is one of essential preconditions for successful aquaculture production. Mahseer (also called sahar or mahasheer - Tor putitora) is a well acknowledged, highly valued indigenous fish of the Himalayan belt. The species is distributed in many rivers, streams and lakes of mid hills of the Himalayan belt from Afghanistan in the west to Myanmar in the east (Skene-dhu, 1923; McDonald, 1948; Day, 1958; Chaturvedi, 1974; Shrestha, 1981; Nautiyal, 1994). In Nepal, mahseer mainly inhabits cool waters of rivers and lakes of mid-hills and inner Terai. Mahseer is one of the potential fish species of Trans-Himalayan countries for fishery development, including aquaculture. In natural systems the fish is known to reach 45 kg of body weight in large rivers. Mahseer is known to be an omnivore fish in its adult stage. In earlier days considering the mouth opening and massive size, the fish was supposed to be a carnivore (Malhotra, 1982). However, we have collected many samples from rivers of Pokhara Valley, where gut contained rice grain, small insects and plants. Mahseer therefore appears to be an opportunistic feeder which feeds on a wide variety of food of plant and animal origin. Mahseer have been found to also feed on green filamentous algae, insect larvae, small molluscs, and algal coatings on rocks (Shrestha, 1997; Negi, 1994; Dubey, 1985). Nautiyal and Lal (1984) reported that in natural habitat food of mahseer fingerlings consisted of insect matter (81.4 percent), plant matter (15.9 percent) and other items including fish (1.6 percent). Knowledge of natural feeding habits of mahseer would provide a basis for formulated feed development for this species. Studies on nutrition and feed management for different developmental stages of mahseer are a prerequisite for farming possibilities of this high value native species. Growth of mahseer in captivity is slower than of fish reared in the wild (Shrestha, 1997). Very little is known about artificial food and growth responses of mahseer. Preliminary studies conducted at ARS (Fish), Pokhara (1998) on diet development for mahseer showed promising results when fed on a feed containing mixture of animal and plant protein sources (Bista and Yamada, 1998). Similar results with different cultivable fish have been described in several other studies (Tacon, 1981; Viola et al., 1982; Wee and Wang, 1987; Juyal, 1994). Mahseer populations have been declining in most of their natural habitats due to impacts caused by industrialization, urbanization, and agricultural development causing ecological alterations and physical changes in natural environment in lakes and rivers of mid hills (Das and Joshi, 1994; Shrestha, 1994). In Lake Phewa of Pokhara Valley, mahseer decline is attributed to pollution and overfishing (Shrestha, 1997). To replenish the declining populations of mahseer in its natural habitats attempts are being made to breed and develop culture techniques of the Tor species. For promotion of mahseer one alternative could be the development of suitable breeding and rearing technology ex-situ, which requires knowledge of their nutritional requirement from hatchlings to adult stage. At present there is only limited knowledge on feed, feeding and nutritional requirement of mahseer. Preliminary studies conducted at the Pokhara Fisheries Research Centre showed promising results when mahseer was fed with pellets containing proteins of animal and plant origin (Bista and Yamada, 1998). Studies on nutrition and feed requirement of different stages of mahseer are a prerequisite for assessment of the possibilities for farming this high value native fish. The present study has aimed to generate baseline data on nutrient requirements so as to develop appropriate feeds to enhance growth of mahseer in captivity, i.e. under aquaculture conditions. The present work describes studies on feed, feeding and nutritional requirements of the species and offers suggestions for the development of fisheries and aquaculture of mahseer. We performed several short term to long term experiments to identify suitable feed for mahseer ranging from early larvae to adult fish. To examine the growth response of hatchlings in captive conditions, experiments with 10-day-old hatchlings were performed from May 6 to July 15, 2000 for a total 35 days. The hatchlings were obtained as breeding by-product of the Pokhara Fisheries Research Centre. Usually, yolk sac is absorbed within 4 days after hatching at water temperature more than 20°C. Larvae start feeding on natural and artificial feed afterwards. In this experiment four treatments with 3 replicate each were examined. In controls zooplankton were fed while in other treatments Japanese crumble No-1, (Treatment 1), microfeed prepared at the Fisheries Research Centre (Treatment 2), and silk worm based microdiet (Treatment 3) were examined for hatchling growth response. Zooplankton for feeding in controls was collected by plankton net of 80µ-mesh size from highly fertilized ponds adjacent to experimental sites. The microdiet was prepared at the Fisheries Research Centre, Pokhara using different ingredients such as shrimp meal, milk powder, soy puff, which was sieves through 300µ mesh. Later on these ingredients were mixed in proper ratio, mixed with 5% of gelatin and 56% of water to prepare paste. The paste was spread over tray and dried in oven at 50°C for one night. Then ground and sieved with 150µ mesh. In each treatment 40 larvae in 50 L of water were stocked. In each tank water supply was maintained through inlet and outlet and water flow was maintained at about 1.0 L per minute. In each treatment water quality parameters such as temperature, DO, pH were measured. The larvae were fed ad libitum from 6 AM to 7 PM 6 times a day. At the beginning all larvae were weighed in water using microbalance to determine their initial weight. The change in body weight was determined once a week in the same way. At the time of growth check 100% population was weighed for accuracy. In this feeding trial mortality loss of hatchlings was zero. No disease was noticed during the study period. This experiment was carried out inside the hatchery. The fry were obtained from the brood collected from Lake Begnas. In 9 treatments the effect of feed on growth of fry of 0.0185 g body weight was examined. This experiment was run for 30 days with 80 hatchlings in 50 L plastic tank where a continued water supply was maintained. Air was supplied through blower at the rate of 0.4-0.5 liter/minute. Feeding started at 8 AM, 10 AM, 12 PM, 2 PM, 4 PM up to the level of satiation. Water temperature and pH were checked at 10 AM and 12 PM, DO at 12 PM daily. Tank bottom cleaning and water change was done in 2 days interval and mortality was checked at the same time. The experimental diets were made from soybean cake, dried shrimp, chicken egg, corn- starch, dry fish, cod liver oil, vitamin and mineral premix. Gelatin was used as a binder for microdiet. The diet-1 was based on 55 percent fishmeal, in diets 2, 3, 4, 5 and 6 the proportion of fishmeal was gradually decreased to 5 percent of diet 1. Similarly soybean cake was used for diets 4 to 6 in gradually increasing order from 12 to 40 percent. Diet 7 was based on fermented soybean while diet 8 consisted of only live zooplankton, and diet 9 was a frozen zooplankton. The microfeed was prepared as described in earlier section. The composition of zooplankton is shown in Table 1. Survival of hatchlings at the end of the trial was 33.3 to 92.1 percent. The highest survival occurred in hatchlings fed with zooplankton while the lowest was in the group fed with the lowest percentage of fishmeal, i.e. diet No.1. Fingerlings of approximately 6g body weight were stocked at a density of 650 individuals in 8 m3 net cages at Phewa Lake, Pokhara, Nepal. In this experiment two treatments were taken where diets containing crude protein 30 percent (Treatment 1) and 40 percent (Treatment 2) were tested on experimental fish (Table 1). To prepare 30 percent and 40 percent feed different ingredients were ground and mixed in appropriate ratios. Powdered ingredients were mixed with 8 percent moisture for pelleting. Californian pellet mill was used to prepare the pellets for experiment. The pellets were crushed by crumble mill to adjust the feed size according to the mouth opening of hatchlings. The experiment was replicated in floating cage of similar dimension (2x2x2 m3). The feed was fed 6 days a week at 3 percent of total body weight of fish in each cage. The daily requirement of diet was split into 3 equal amounts and fed 3 times a day. The experiment lasted for 210 days from December 1998 to June 1999. The quantity of daily ration was adjusted on the basis of growth which was checked at 30 day intervals. The growth of fingerlings was estimated by using electronic balance. During the experimental period basic water quality parameters (dissolved oxygen concentration,, temperature and pH of the location) were recorded. This experiment was performed in floating cages of 2 m x 2m x 2m dimensions from January to late May 2001 in Lake Phewa. We took 4 treatments for this experiment. The following diets were fed as pellets: in treatment 1, fish meal (75 percent) mixed with other ingredients, in treatment 2, fish meal with 18 percent soy meal, in treatment 3, 50 percent soy with 12 percent fish meal, and in treatment 4, 50 percent soy and 23 percent fish meal. As binder wheat meal was used in all the diets. At the beginning average stocking size was 20.0±2.0 g (TL 13±2 cm). In each cage 150 fish were stocked. This experiment was conducted for 140 days. Fish in each cage were fed with different feed at the rate of 5 percent of total body weight 4 times a day. The growth check was performed near the Phewa Lake shoreline using electronic balance. During the study period the mortality in cages was less than 5 percent. This experiment was carried out as indoor trial in 500 liter round bottom circulation tank. The yearlings of mahseer with an average weight of 57-61 g were stocked at a density of 25 fish in each treatment. Each was replicated. The experimental diets were made by using locally purchased fish meal, shrimp meal, wheat flour, corn starch, soybean puff, fish oil, vitamin and mineral mixtures. Diet 1 was imported commercial Japanese feed for trout. All diets were in pellet form. The diets were isonitric. The crude protein level of diet 1, 2 and 3 was 43 percent, 38 percent and 43 percent respectively. The experiment was carried out for 70 days from April to June. Water circulation and aeration was continuous. Daily feeding was carried at 7 AM, 11 AM and 3 PM, three times a day. Water temperature and pH were checked at 10 AM and 12 PM, and DO at 12 PM every day. Growth pattern of hatchlings fed with different variety of feed generally increased during most of the study period. 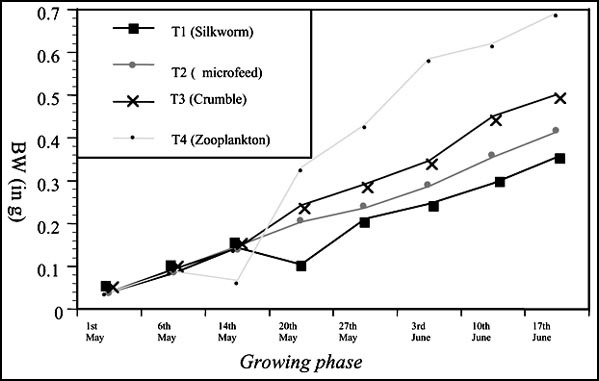 The group fed with zooplankton showed highest growth response, while group fed with silkworm pupae showed lowest growth response. Other hatchlings fed with micro-feed prepared at Fisheries Farm Pokhara and Japanese crumble showed moderate growth response. The group fed with Japanese crumble showed better growth than locally made micro-feed. During the study period variation in DO was from 6 to 9 mg/L, change in water temperature was 24 to 28°C and pH varied from 7-9 during the study period. During the experiment period water temperature ranged from 22-30°C. The difference in pH was 0.6, while DO ranged 1.2 mg/L during 30 days of study period. At the end of highest growth occurred in treatment fed with D-8 (live zooplankton). Other treatment did not show substantial changes in body weight during the study period. The survival rate of fry ranged from 33.3- 92.1%. The highest survival occurred in the group fed with live zooplankton and lowest was in the group fed with diet 1. The growth responses of mahseer under different dietary treatments are illustrated in Figure 1. The fingerlings of mahseer well accepted both 30% and 40% crude protein containing diet and fish fed actively. Body weight gain in each growth period until 90 days was significantly different (P<0.05) within the treatment 1. Body weight gain of fish fed on 40 percent protein diet did not showed any significant difference during same growing period (until 90 days) in the treatment but after 90 days till harvest fish grew significantly. There was no significant difference between treatment in weight gain till 150 days but after 150 days there was a significant difference (P<0.05) between 30 percent and 40 percent diet. The mean value of body weight of mahseer obtained at harvest were 19.5 g and 22.5 g from 30 percent and 40 percent protein diet fed group, respectively. During the study water temperature was low during the first month but later on water temperature increased till the end of the study period. The results showed that growth of advanced fingerlings was positively consistent in all the treatments. The highest body weight was achieved in the treatment with combination of fish meal and soy meal. At first two months fingerlings did not grow despite of feeding at the same rate. After March growth increased gradually till the end of the study period. In winter months fish were usually inactive and consumed the supplied feed inactively. But while feed ingredients and their composition were different the growth response was almost similar except in the treatment 2 fed with combination of fish meal and soy meal (75% and 18%). In this trial the highest effect was shown in the treatment fed with Japanese commercial feed on growers, while the lowest growth and net gain occurred in the treatment fed with diet comprising of 30% soybean and 27% fish meal during a 70 day culture period. During the study water temperature ranged from 24.3 to 29.9°C. The pH varied from 6.8 to 9.4, and DO from 3.5 to 8.0 mg/L. In this experiment the survival was 100%. Our present study showed that hatchlings, fry, fingerlings and growers mahseer could be successfully reared on artificial diets, but natural zooplankton was the best food for hatchlings of mahseer (Fig. 1 and 2). It is known that most fish species require plankton food during their earliest life stages of development (Huet, 1972). The best food to grow small hatchlings of the carps rohu (Labeo rohita), bhakur (Catla catla), and mrigala (Cirrhinus mrigala) during their earlier stages is plankton in highly enriched pond waters (Jhingaran and Pullin, 1987). Our studies showed that mahseer hatchlings could also be successfully reared with plankton food grown in ponds. However, hatchling growth studies have not yet been attempted in fertilized ponds due to the small number of hatchlings available for such studies. Since hatchlings could be rear successfully with highest growth and turnover in most of the experiments one may speculate that mahseer hatchlings could be raised successfully in fertilized ponds. Hatchlings fed with Japanese commercial feed showed faster growth than with other supplementary feed. The least growth attained was with silk worm based feed. Silk worm is considered one of the important ingredients in fish diets. However, in our case it is possible that small hatchlings could not utilize them properly as an adult fish could. In other experiments when hatchlings were fed with eight different types of feed, fastest body growth response occurred in the group fed with zooplankton (Fig. 2). Somatic growth response with other feeds only varied unsubstantially. The above two experiments confirmed that for mahseer hatchlings natural plankton are the best initial food. Feeding experiment with fingerlings showed that pellet feed could be one of alternatives to raise the fish in captive condition. The feed supplied to experimental fish contained 30% and 40% protein. In this experiment initial body weight of fingerlings was about 6.0 g. In 210 days fingerlings fed with 30% protein feed gained about 19.6 g while another group fed with 40% feed attained about 22.4 g average weight. This experiment showed that though the growth rate was low mahseer could be raised on supplementary pellet feed. In another study conducted with advanced fiongerlings of approximately 19-23 g the weight attained was 44 g in 6 months. The results showed poor growth performance of fingerlings. This might be related to low water temperature from January to March when it was only 15-18°C. The growth was slightly faster with increasing water temperature after March. This indicates that mahseer growth response could be increased with increasing water temperature, and this is common with many other cyprinids. In the treatment where fingerlings were fed with a mixture of fishmeal and soy meal in equal proportion they grew fastest, while slow growth was observed with the diet with large proportion of soybean. In another experiment highest gain in body weight occurred in treatment fed with Japanese crumble comprising a high proportion of animal origin ingredients. 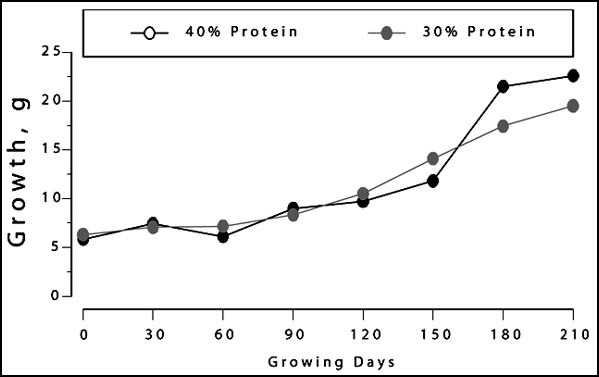 In another treatment where proportion of animal protein was low the net gain was relatively less (Fig 6). The present study showed that feed choice changes with age and size of mahseer. Minute hatchlings showed higher inclination towards planktonic food, which is abundant in natural waters. Later on when fish grow up to fingerling and grower stages their choice is inclined more towards animal origin food. This is supported by analyses of gut contents of 101 adult mahseer (250 to 3000 g) collected from different rivers and lakes: about 50 percent comprised animal matter, 13% plant matter and the rest was unidentified matter. This result shows that supplementary feed with large proportion of animal matter and relatively small part of plant matter would be the most appropriate feed for grower mahseer. ARS (Fish), 1998. Annual Technical Report, Agriculture Research Centre (Fisheries), Pokhara. Baidya, A. P., B. K. Shrestha and O. Yamada, 1998. Maturity stage of oocytes on different types of hormones induced sahar, Tor putitora. In: Present Status of Fisheries Research, Development and Education, (B. R. Pradhan, S. K. Wagle, Y. Osamu and M. Takano, eds): pp.71-74. NWFDP/NARC/JICA. Bista, J. D., R. K. Shrestha and O. Yamada, 1998. On the relationship of GSI, total lipid and moisture content of sahar, Tor putitora. In: Present Status of Fisheries Research, Development and Education, (B. R. Pradhan, S. K. Wagle, Y. Osamu and M. Takano, eds): pp. 68-70. NWFDP/NARC/JICA. Chaturvedi, S.K., 1974. Spawning biology of Tor mahseer Tor tor (Ham). J. Bom. Nat. Hist. Soc. 12: 63-73. Das, P. and K. D. Joshi, 1994. Mahseer conservation - present and future. P. Nautiyal (comp. & ed. ): Mahseer: The Game Fish: D3-D9. Rachna, Srinagar, India. Day, F., 1958. The Fishes of India: Being a natural history of the fishes known to inhabit the seas and fresh waters of India, Burma and Ceylon. Vol. 1(text). William Dawson and Sons Ltd., London. 564p. Desai, V. R., 1973. Studies on the fishery and biology of Tor tor (Ham.) from river Narmada.II. Maturity, fecundity and larval development. Proc. Indian Nat. Soc. Acad. 39(2): 228-248. Dubey, G. P., 1985. Conservation of dying King Mahseer the mighty game fish and its future role in reservoir fisheries. Punjab Fisheries Bulletin 9, No. 182. Juyal, C. P., 1994. Food conservation efficiency of Himalayan Mahseer. P. Nantiyal (comp. & ed. ): Mahseer: The Game Fish: D91-D97. Rachna, Srinagar, India. Gurung, T. B. and G.B.N. Pradhan, 1994. Genetical resources of sahar (Tor putitora, Ham.) in Nepal. Fisheries Dev. Division, Dept. of Agriculture, MOA, Nepal. Huet, M., 1972. Breeding and cultivation of salmonids. In: Text Book of Fish Culture Breeding and Cultivation of Fish, pp. 59-110. Fishing News Books, Surrey, England. Jackson, A.J., B.S. Capper and A.J. Matty, 1982. Evaluation of some plant proteins in complete diets for the tilapia Sarotherodon mossambicus. Aquaculture 27: 97-109. Masuda, K. and K. R. Bastola, 1984. Breeding of Sahar (Tor putitora, Ham.) using naturally Matured Broods in Tadi River of Central Nepal. Report submitted to the Fisheries Development Division, HMG/Nepal. McDonald, A. St. J., 1948. Circumventing the mahseer and other sporting fish in India and Burma. Natraj Publication, Dehradun, India. 16p. Nautiyal, P., 1994. Mahseer: The game fish (Natural History, Status and Conservation Practices in India and Nepal). Compiled and edited by Nautiyal P. Akasdeep Printers, Dehradun, India. Negi, S. S., 1994. Himalayan fishes and fisheries, carps or cyprinoids. Samoon, M. H., 1994. Cultural feasibility of Deccan Mahaseer, Tor khudree (Sykes). P. Nautiyal (comp. & ed. ): Mahaseer The Game Fish: D79-D84. Rachna, Srinagar, India. Shiau, S.T., J.L. Chuang and C.L. Sun, 1987. Inclusion of tilapia (Oreochromis x O. aureus) diets at two protein levels. Aquaculture 65: 251-261. Shrestha, B. C., A. K. Rai, T. B. Gurung and K. Mori, 1990. Successful artificial induced spawning of Himalayan Mahseer (Tor putitora, Ham.) in Pokhara Valley, Nepal. The Second Asian Fisheries Forum. Asian Fish. Soc. Shrestha, T. K., 1994. Development of Mahseer culture towards ranching. P. Nautiyal (comp. & ed. ): Mahseer the Game Fish: D26-D41. Rachna, Srinagar, India. Shrestha, T. K., 1997. Prospects of propagating the Mahseer in Phewa Lake of the Pokhara Valley. The Mahseer: 70-71. Skene-dhu, 1923. The angler in India or the mighty mahseer. Natraj Publication, India.786p. Tacon, A.G.J., 1981. The possible substitution of fishmeal in fish diets. In: Proceedings of the SMBA/HIDB fish farming meeting: pp.46-56. Oban, Great Britain. Viola, S., S. Mokady and Y. Arieli, 1982. Partial and complete replacement of fish meal by soybean meal in feeds for intensive culture of carp. Aquaculture 26: 223-236. Wee, K.L. and S.S. Wang, 1987. Nutritive value of Leucaena leaf and in pelleted feed for Nile Tilapia. Aquaculture 62:97-108.